This post is part of “The World of Jews in Borisov/Barysaw,” in which I weave a tapestry of the lives of different members of the area’s Jewish community. Earlier posts about family members of those who have been in contact with me are here. This is Part 2 of Finding Elkinds of Borisov/Barysaw. Part 1 is here. 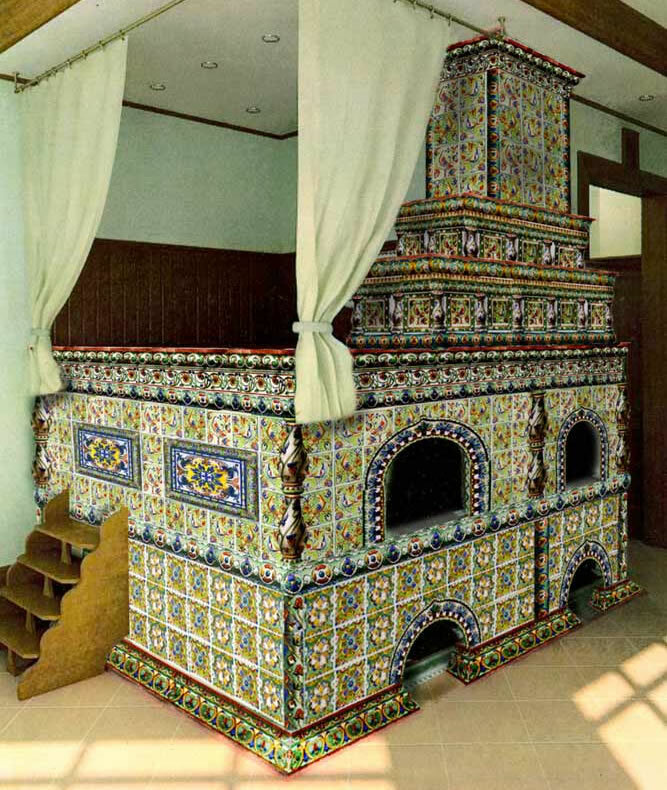 A spectacular example of a tile-covered Russian stove in the peasant style, with a space for sleeping on top, and steps to climb up there. See more about these tiles and stoves below. These two posts about Borisov Elkinds began when Logan Lockabey emailed me about his search for family members named Elkin or Elkind. In last week’s post, I wrote about a tragic chapter in Elkin/Elkind history: the deaths in Stalin’s Great Terror of five Borisov/Barysaw natives by those names. This week, I promised a happier Elkind chapter, about information I found while researching for the first post. On an unofficial Russian-language Borisov City website, I had found short bios of seven additional Borisov Elkinds from the past. These “new” Elkinds may or may not have been Logan’s family members. I haven’t had time to translate of all of their bios perfectly enough to post online (as I’ve said before, my Russian is good but not fast, since I use the dictionary a lot). I’ve passed along all these short life stories to Logan, in case any may be members of his family. I will update this post in future if he determines that. Meanwhile, though, two Elkinds on this new list were intriguing to me. “ELKIND Nekhama Girshevna, entrepreneur. 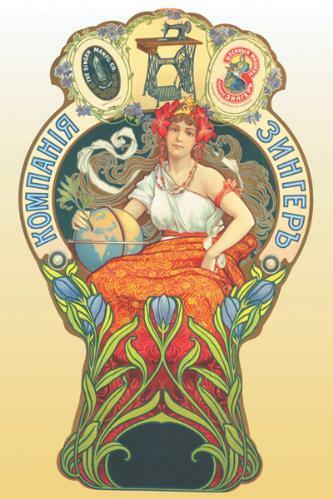 She owned one of Borisov’s pottery-tile enterprises, which opened in 1898. I was excited about these two Elkinds for a couple of reasons. The first is that they lived in Borisov at a time when my grandfather could have known them. My personal focus in most of these blog posts has been on the late 19th and early 20th centuries, before my grandfather, Boris L. Bobroff (Bobrov) emigrated to the United States. I’ve wanted to know more about the places he and his family lived, and about the people he might have known (or known of). The second reason I was interested is that these two Elkind bios give information on the manufacturing enterprises that each created. I love discovering the kind of work people did in the towns I’m researching because it also tells us something about the nature of the town itself. Not only do these little Elkind bios list the type of company run by each Elkind. If you read them closely, they also hint at a bit more: Borisov apparently had several pottery tile companies. 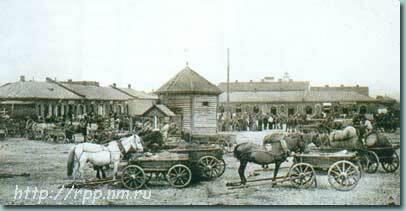 And the tobacco manufactory which Yudel Elkind opened was “one of the first of the capitalist type” in Borisov in 1883. So far, I’ve had little luck finding information about tobacco manufacturing in late 19th-century Russia. So for the time being, I can’t explore Yudel Elkind’s work. 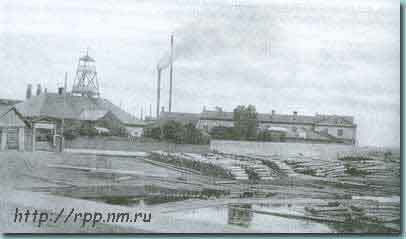 The one bit of tangential imagery I have is 1907 photos of two match factories in Borisov. 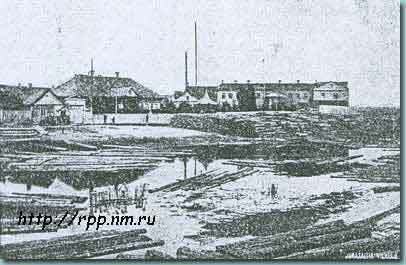 You can see the Victoria Match Factory here, and the Berezina Factory (left). 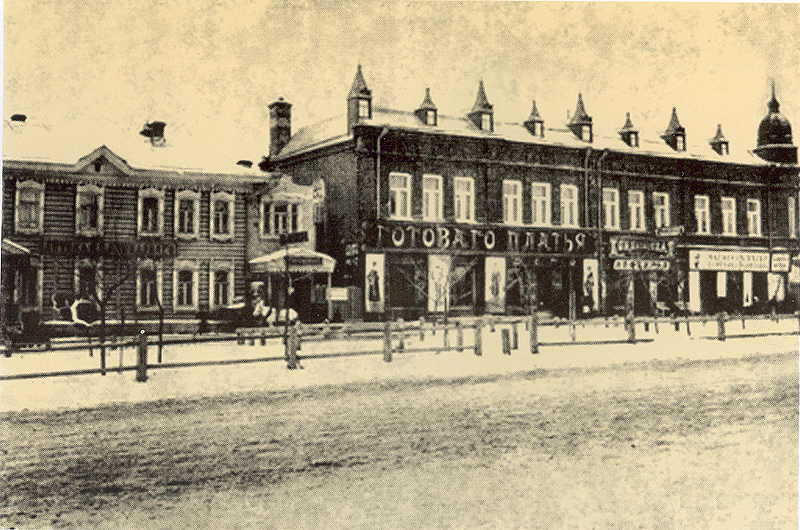 These photos give a feeling of the factories beginning to develop in Borisov/Barysaw around the turn of the century. We can only wonder for now whether Yudel Elkind’s tobacco “manufactory,” opened about 25 years before these match factory photos were taken, resembled them in any way. It’s conceivable that Elkind’s tobacco manufactory, described as “one of the first Borisov enterprises of the capitalist type,” may have been fairly large. The word “manufactory” (in English and Russian) suggests some kind of production-line process done by hand, without machinery. But it can also be an archaic word for “factory.” What kind of machinery might Elkin’s manufactory have involved, if any? I believe that figuring out what the next questions are is the first stage in good research. That means we’re making progress! Tile from a Belarusian website. This tile is decorated with a relief design. I would love to know the story of Nekhama Girshevna Elkind herself, because she must have been a very enterprising and clever woman. Since I don’t have her specific life history, I turned to researching the type of work she did. And here I discovered something interesting: there were a lot of Belorussian Jews in the pottery-tile business at the end of the 19th century. So it seems that Nekhama was in good company with her business. She had other similar examples in her area, and maybe some solid competition. 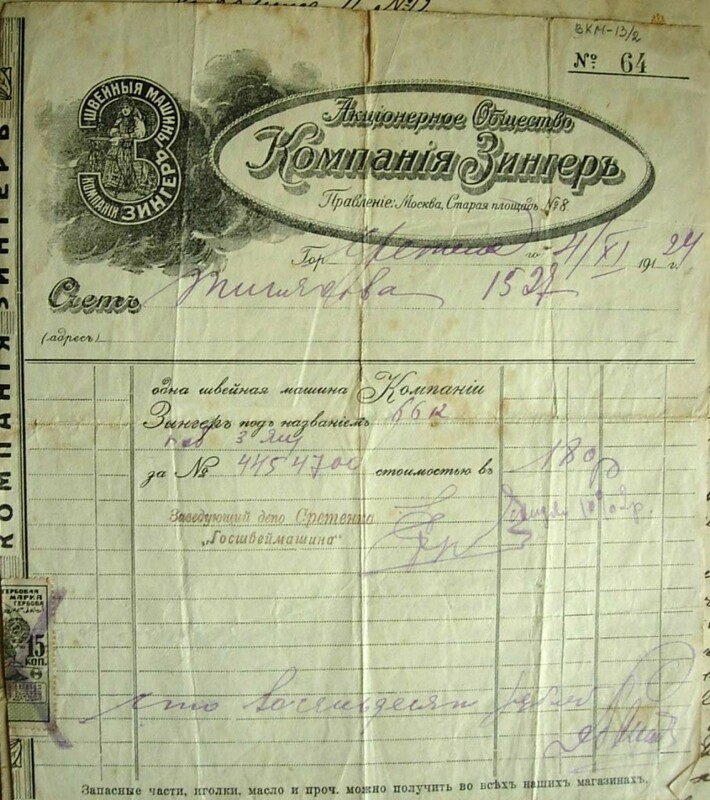 According to the 1904 Collection of Materials about the Economic Position of Jews in Russia (Сборник матеріалов об економическом положенiи евреев в россiи), several places in Belarus had “favorable soil characteristics, conducive to the rise of the pottery and tile business.” There were abundant clay deposits not far from the surface, along with plenty of the fuel needed for firing pottery. And everyone needed to buy dishes and tiles. So Nekhama Elkind had a guaranteed market. Snippet from Collection of Materials about the Economic Position of Jews in Russia, 1904. Gives the number of Jewish potters and tile masters in Minsk, Vitebsk, and Mogilev guberniyas (alphabet written in the pre-revolutionary style). Borisov uyezd’s neighbor, Mogilev province, had the hottest hotbed of Jewish tile and pottery makers. By 1909, there were 415 Jewish pottery and tile makers there, and 14 tile plants. The tiles they produced were sold in all cities of Mogilev, and in Kiev and Kremenchug in the Ukraine. Minsk guberniya, where Borisov is located, came in second to Mogilev, according to this source. 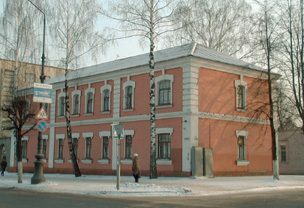 Of 733 Belorussian Jews involved in making pottery and tile, 160 lived in Minsk guberniya (province). 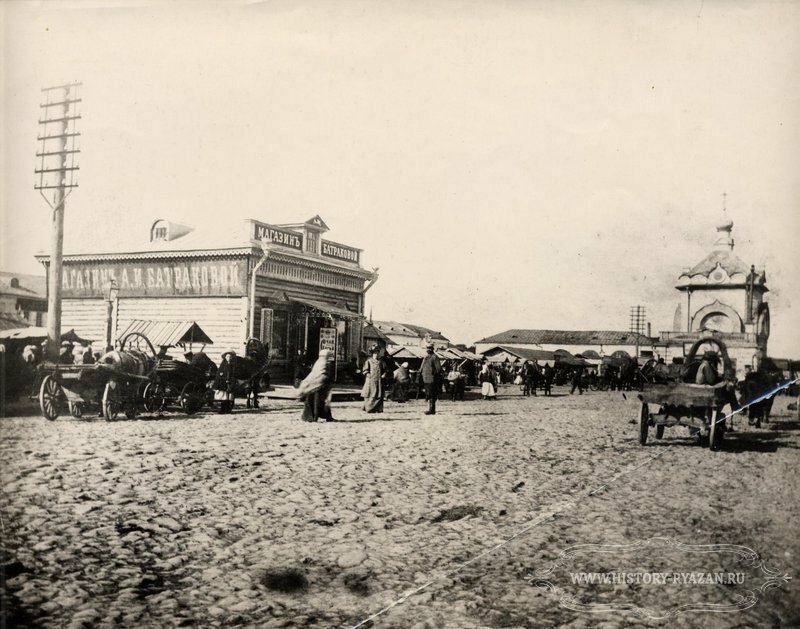 “The town of Zembin (in Borisov uyezd) sells its wares in nearby cities and small towns at a yearly sum of 2,000 rubles. In the small town of Ivenets (Minsk uyezd), traveling merchants yearly buy 5,000 rubles worth of earthenware dishes and tiles from the makers. 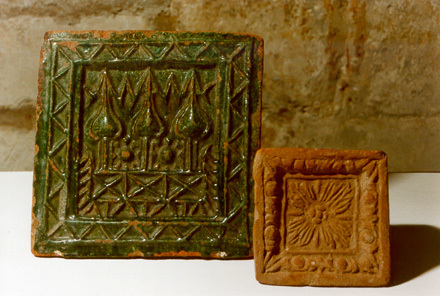 Green tiles from Ivenets may be seen very often in homes in surrounding cities and towns. Borisov (here "Barysau") is in the bottom right corner of the map. The red star marks Zembin in the center. The city of Borisov isn’t mentioned here. So we might wonder whether Nekhama Elkind’s tile enterprise, along with the others referred to her bio, were actually in the town of Zembin in Borisov uyezd, rather than in the city of Borisov/Barysaw, 14 miles southeast of Zembin (see map, right). How large was Nekhama’s workshop? The Economic Position of Jews in Russia says that the average size of ceramic shops in Belorussia was two people, generally a master and an apprentice. So Nekhama Elkind’s tile shop was likely small. Was she only the owner of the shop, or did she create the tiles herself? For now, I can’t answer this question. But I did find descriptions of the process of creating the tiles, the method that Nekhama Elkind’s workshop undoubtedbly used. How did Nekhama Elkind create her tiles? A Russian English-language website describes the process, and I like to try to envision Nekhama going through each step – or maybe directing as some one else did it. Can you picture her in the description below? “the potter would temper clay with his hands, his fingers penetrating inside the clay and removing small pebbles and clots, anything that could lead to cracks during baking. The clay took in the warmth of the master’s hands and became pliable. Then the master would fill it into a wooden mould with a carved ornamentation on the bottom. Russian tiles of the 16th-17th centuries. One is glazed, the other isn't (earthenware). 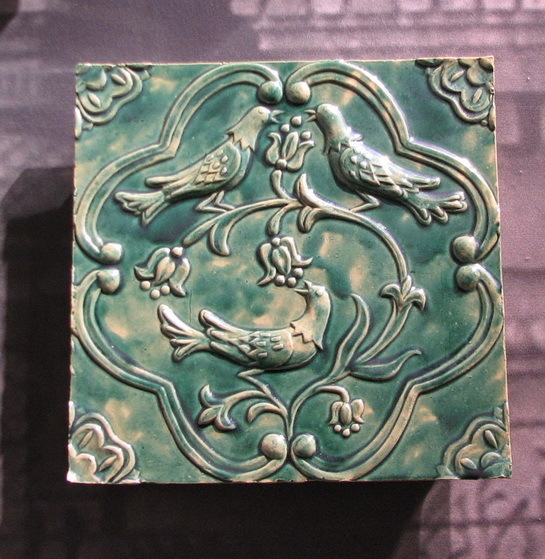 This carved design inside the mold created a relief design such as the birds on the blue tile above and the two tiles left. The bottom of the mold was first “sanded” to prevent the clay from sticking. Last, the decoration, whether relief or painted, was glazed or enameled. As this description suggests, the earliest Russian tiles, beginning in the 15th and 16th centuries were decorated with relief designs. 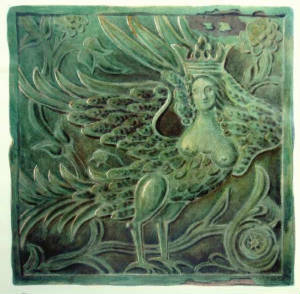 By the 18th century, the front of tiles was often left flat and painted with elaborate designs (see photo below). What was Nekhama Elkind’s market for her tiles? We can all imagine how large the market for pottery dishes must have been in Russia, since everyone needs dishes. But what about tiles? Why were they in such wide demand? Tiles were used in Russia to decorate lavish interior and exterior walls. 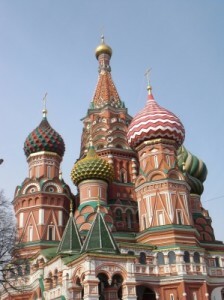 The most famous example of tile decoration on the outside of a building is undoubtedly St. Basil’s Cathedral in Moscow. But the real reason there was such a market for tiles in Russia was the Russian stove, which was used for heating and sometimes also for cooking and sleeping (see photo at top of this post). Why did the Russian style of stove create such a huge market for pottery tiles? Russian stoves were big, with a vast surface area. Covering them with tiles meant buying a lot of tiles. I don’t think that the average peasant stove was sheathed in tiles. But anyone who could afford them wanted them, for their beauty and practicality. Tiles added to the stove’s heat transfer capacity. And they were much easier to clean than earthen surfaces. 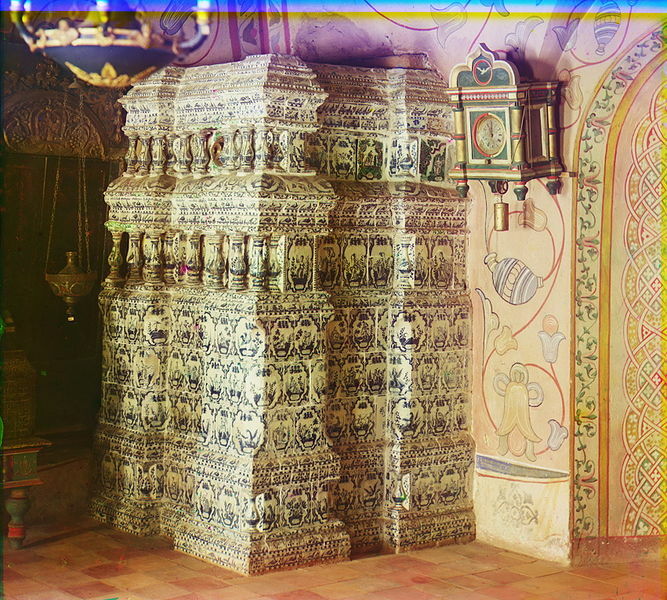 Tile-covered Russian stove from the Rostov Prince's Palace. Note many of these tiles are the flat-surfaced, painted style. Why did the Russians have gigantic stoves that required so many tiles to decorate, creating a great market for Nekhama’s wares? I’ve always wondered what was going on inside all that bulk that would make Russians want to sacrifice so much of their living space to them. 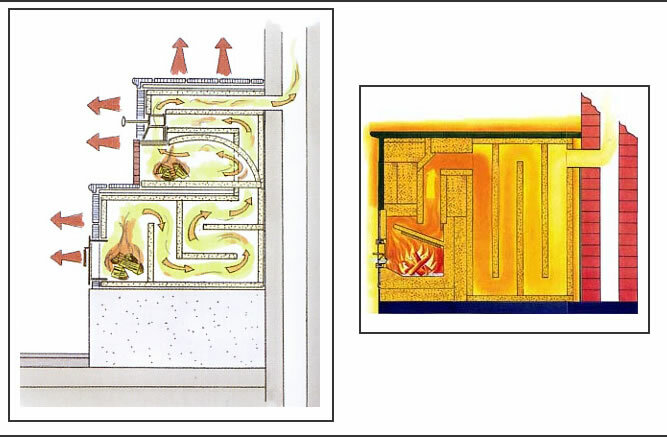 A fascinating article in Low Tech Magazine explains that inside Russian stoves were labyrinths of smoke channels (see diagram below). These channels held onto the heat, allowing it to be absorbed into the masonry rather than escaping up a chimney. They also allowed more complete combustion of the fuel, unlike the partial combustion of our fireplaces, which coat the chimney with half-burned fuel (creosote). Over many hours, the Russian stove’s masonry and tiles slowly radiated their heat (they didn’t use convection, as most of our heating systems do in the US). Interior diagrams of Russian stoves. The one on the left appears to be a more vertical stove, while the one on the right seems to be the more horizontal peasant style. Did Nekhama sell her tiles only to the wealthy, or was her market broader? All Russians, from the poorest peasants to tsars, heated their homes with these huge stoves. But did the average Russian’s stove have a layer of tiles? Was Nekhama Elkind likely selling her tiles only to the wealthy, or could her market have been wider? Well, this general statement doesn’t answer the question fully. I’ll be on the lookout for more information on Nekhama Elkind’s tile customers in future. Meanwhile, though, it seems clear that the frigid Russian winters, and the stoves designed to cope with them, likely created her market. And the rich, accessible clay deposits of Borisov uyezd gave her the raw materials to meet that market. I’ll end this post with some additional images of exquisite Russian tiled stoves. Before I do, though, I’d like to take a moment to dedicate this post to a dear friend, Saul Scheidlinger, who died this past week, and to his wife, Rosalyn Tauber-Scheidlinger. Saul was a psychologist who made great contributions to the field of child and adolescent group psychotherapy. He was appreciated worldwide for his wisdom and as a great teacher and trainer. He was a cultured and lovely man, who, with extraordinary grace, overcame profound tragedies earlier in his life. I miss him. 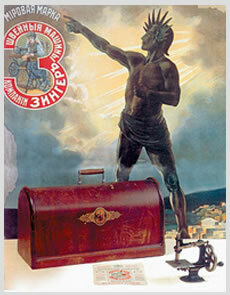 And I think he would have enjoyed these images of artistic Russian stoves. Left to right: Russian tiled stove, 1680; Fairy tale illustration by I. A. Bilibin with tiled peasant stove in background; Red (earthenware?) tiled Russian stove. 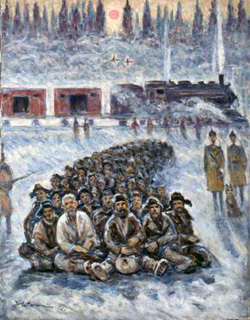 "Moving Out" by Nikolai Getman, who himself was imprisoned in Stalin's Gulag. 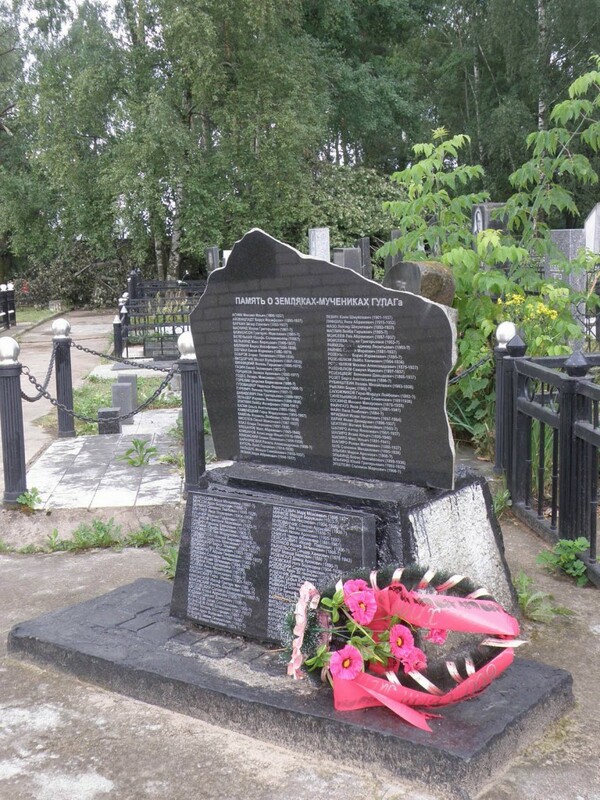 Last week, I posted a translated version of Aleksandr Rosenblyum’s list of Jewish GULAG victims from Borisov. Within a day, over a hundred JewishJen Belarus participants had already checked the list for their family members. Logan Lockabey was among those who emailed me. He had searched my site’s list and found several Elkins and Elkinds, the names he was looking for. He wrote to take me up on my offer to translate the short bios that accompany each name on Rosenblyum’s Russian-language list. 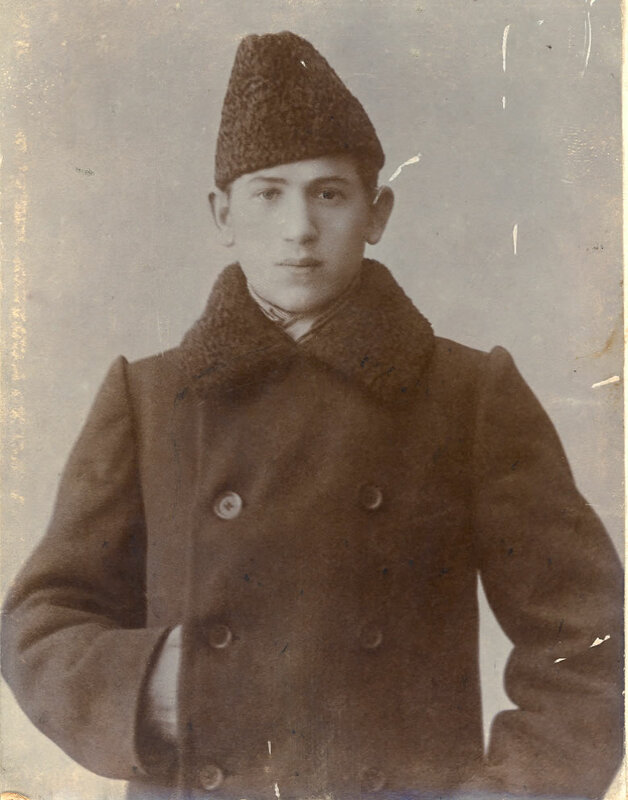 Julius Grigorievich Elkind, born in Borisov in 1902, died in Stalin's Terror, 1938. Rosenblyum has spent years compiling his list, and some names include photographs. These photos are breathtakingly moving, posted next to the stories of each person’s arrest and sentencing on invented charges. Checking for Logan’s Elkin/ds, I found that one of them, Julius Grigorievich Elkind, was among the entries that included a photograph (left). Julius was 36 years old when he lost his life in Stalin’s Great Terror. 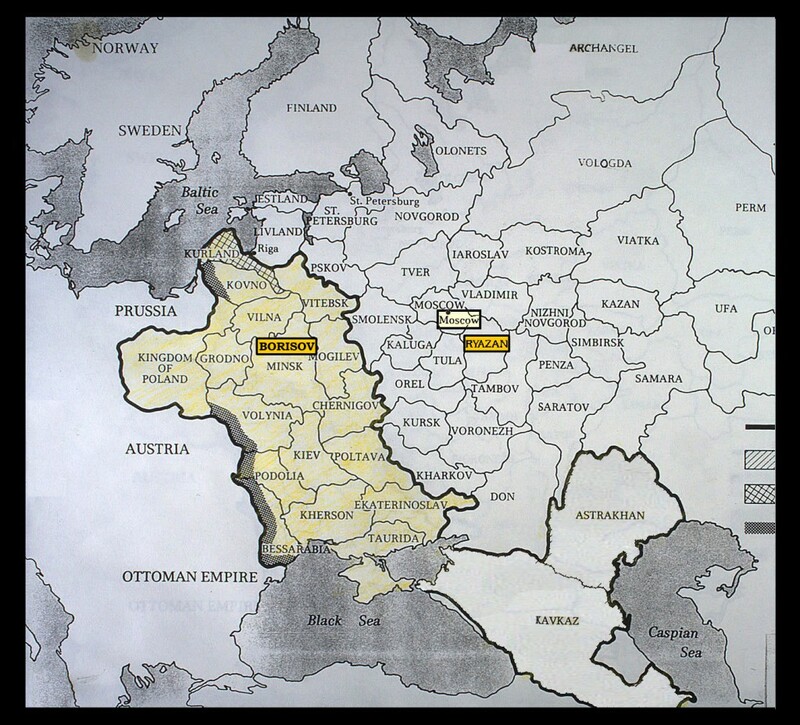 As I began the translations for Logan, I decided I’d post them here and use this opportunity to show a little of how I’ve been working through the research for my “The world of Jews in Ryazan” articles (and currently “The world of Jews in Borisov/Barysaw”). 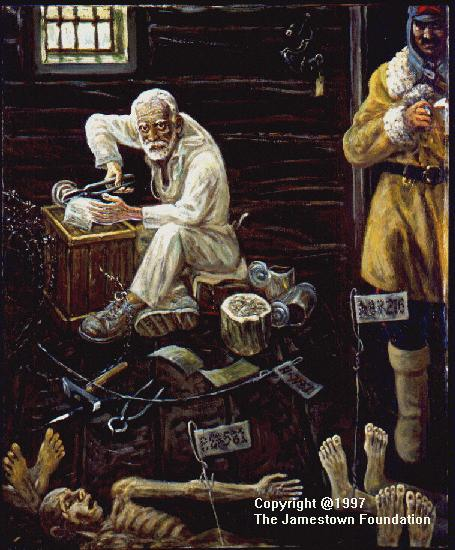 Getman's painting of a morgue in a goldmine prison camp in Russia's far northeast. 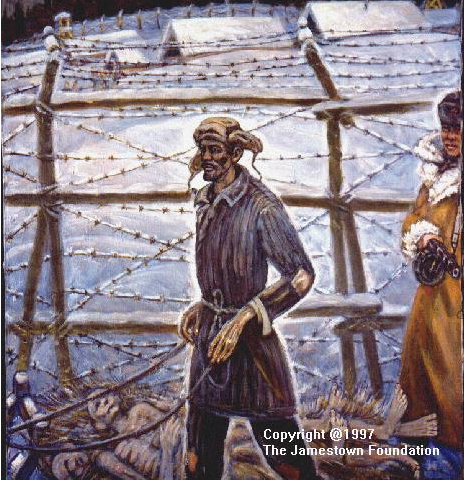 The Jamestown Foundation played a major role in preserving and protecting these paintings, which are the only known visual record of Stalin's camps. Unlike the Nazis, who recorded and preserved a detailed visual history of the Holocaust, the Soviets made no images of their camps. Please keep in mind as you read these bios that the charges were fabricated. There were no real trials or any other form of due process. None of these arrests and deaths were warranted. They were part of a program of terror by Stalin against his own people, during which millions of Russian citizens lost their lives by being summarily executed or through starvation and exposure in labor camps. 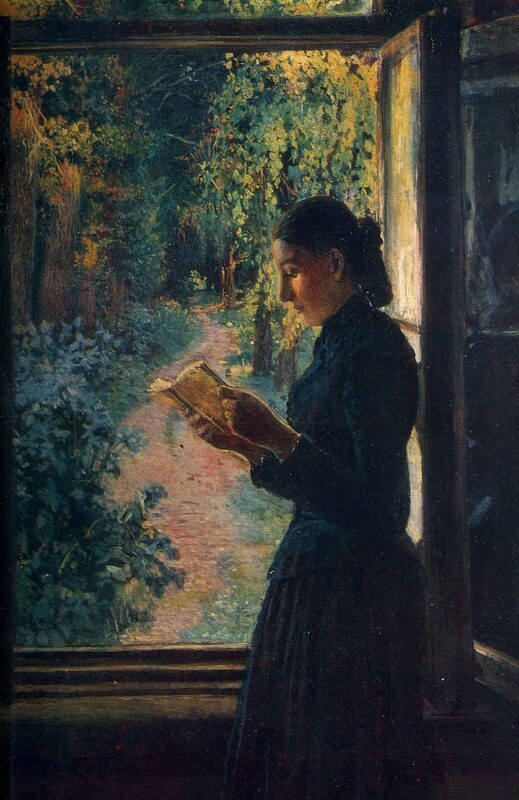 ELKIN Ilya Isaakovich (1888 -? ), [my information for this entry is taken partly from a more complete entry for him here.] Born in the village of Ratutichi. Expert in and promoter of Esperanto. Worked at BELRAD (Belarussian Radio), where he managed broadcasts of programs in Esperanto. Because the authorities found this language [Esperanto] objectionable, Elkin was arrested January 26, 1936, and immediately charged with anti-Soviet agitation and sentenced to three years’ imprisonment. His Esperanto department [at BELRAD] was eliminated. There is as yet no information about his fate beyond this. Rehabilitated in 1990. ELKIN Miron Aronovich (1900 – 1946), Party secretary of the Borisov Glass Plant. Arrested August 8, 1937, on charges of being a Trotskyist. On 10 October 1938, by extra-judicial decree, he was sentenced to imprisonment in a labor camp for 5 years. He was not released at the end of this period, and he died in prison. ELKIND Boris Isaakovich (1891 -? ), Born in Priyamino near Borisov. Collective farmer at “Chyrvony Uskhod” Collective Farm in the Smolevich district of Minsk oblast. Arrested December 22, 1932, on charges of sabotage and immediately sentenced to 5 years imprisonment. Rehabilitated in 1989. Getman's painting of the daily sled-pickup of bodies of prisoners who died overnight. 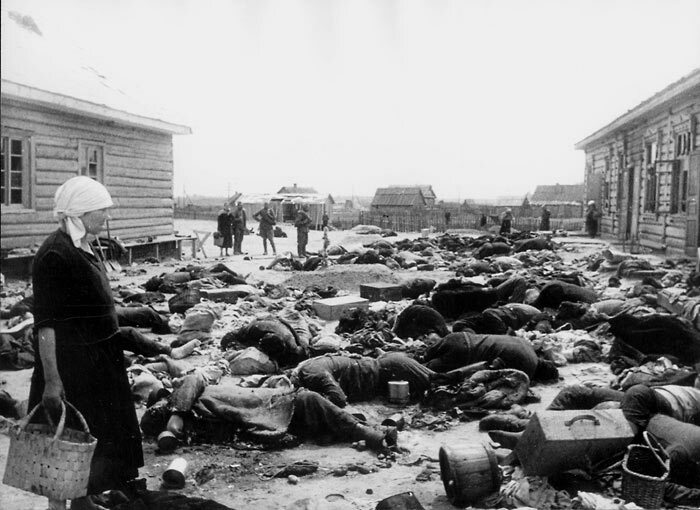 Estimates of the numbers who died in Stalin's camps range upward of 10 million. ELKIND Boris Mikhailovich (1899 – 1936), native of Borisov. Lawyer. Lived and worked in Moscow. Member of the Regional Board of Defense Lawyers. 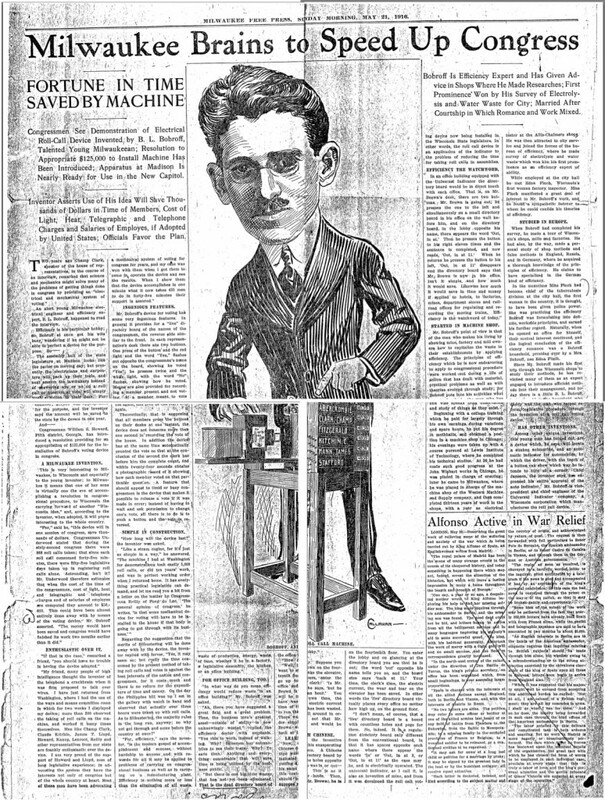 Arrested 24 November, 1935, on fabricated charges of espionage and shot on May 11, 1936. ELKIND Julius Grigorievich (1902 – 1938), native of Borisov. [See photo above.] He lived and worked in Moscow. On Aug. 26, 1938, Assistant Chief Transport Prosecutor of the Military Collegium of the Supreme Court of the USSR sentenced him on fabricated charges to capital punishment and he was shot on the same day. I found these brief biographies deeply affecting, and wanted to see whether I could find out more about these these people in happier times, before their arrests. Following my usual process, I googled each name (I used the Cyrillic version because Russian language websites are more likely to give information on relatively unknown countrymen and women than English language ones). Unfortunately, I didn’t find anything new about these five GULAG victims. But I did find short bios of seven other Borisov Elkinds from the past. I had been planning to write about some of these new (to me) Elkinds here. But the process of writing about Stalin’s Terror and seeing Getman’s images has put me in a very somber mood. I can’t write now about the lives of other Elkinds who lived in different times. And it doesn’t feel at all appropriate to include that material in this entry. So it will wait till a later time. And that post will be fuller of life than of death. 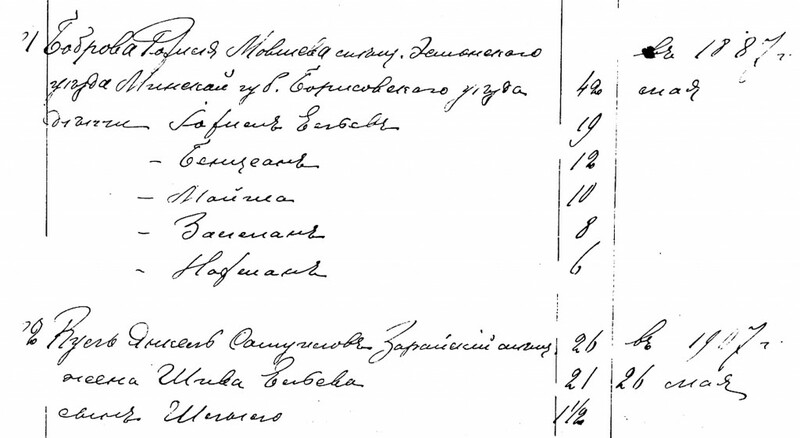 A few weeks ago, I discovered – through Russian Census and Ellis Island material sent to me by Leon Kull – that my grandfather’s family probably came from Borisov uyezd (county) in what is now Belarus. Ever since then, I’ve felt an unsettling transition underway inside me. For years, the only place in Russia that I knew my grandfather had lived was Ryazan. Several months ago, I started writing a blog thread about the world of Jews in Ryazan. My interest was not only my own grandfather, but also other people he might have known or been close to. Ryazan was outside the Pale of Settlement, to which most Jewish citizens of the Russian Empire were confined by law beginning under Catherine the Great. To live outside the Pale, Jews had to obtain official permits given only to people in certain professions and a very few other cases. So I began by looking at a tiny group of Jewish residents of this rather unlikely spot in central Russia. It’s still a mystery to me exactly how my grandfather, Boris L. Bobroff, got to Ryazan, and I certainly haven’t given up trying to figure that out. Meanwhile, though, I feel a bit as if I’m being called home, to the place where my grandfather – or at least his family – were likely born and lived some part of their lives. So now I’ve decided to begin a new blog thread, the world of Jews in Borisov. Dangers ahead inside the Pale? In facing back toward Borisov, I feel I’m moving into somewhat dangerous emotional territory. Life inside the Pale was what so many of our ancestors struggled to leave behind. It was often a life of confinement, restriction, poverty, and lack of opportunity. 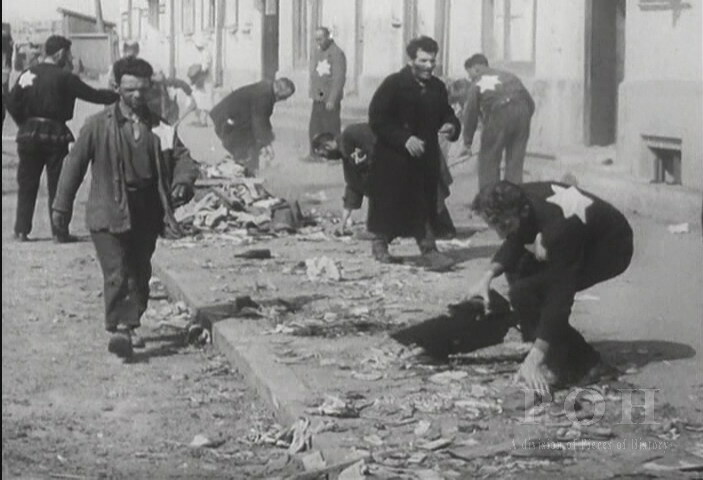 And of course those who were unable to get out were caught up in the Holocaust. 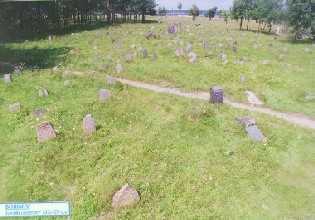 The Borisov towns where my ancestors originated are now dotted with memorials to Jews massacred in mass shootings. An example is the small village of Es’mony, the childhood home of Rokhilya Bobrova, probably a close relative of my grandfather who also lived in Ryazan. 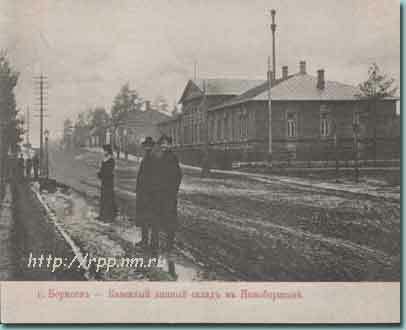 Polynskaya Street in Borisov, during the 1918 German occupation (electrification installed by the Germans). Visible are a pharmacy, hat shop, and mercer (textile dealer). 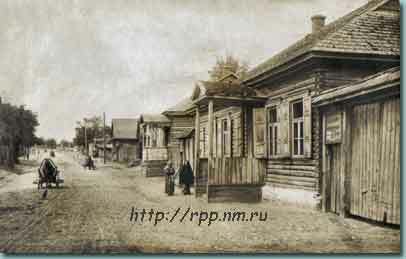 By living in Ryazan, and later the United States, my grandfather had, by 1904, escaped the Pale. Now I’m plunging right back into it. Why? I suppose it’s because the Pale is where so many Russian Jews came from. We can’t fully understand their lives unless we have some idea of their origins, and of the conditions in which they dreamed of other lives. So now I’ve begun a process of trying to learn about a new place, Borisov, just as I had been excited to learn about Ryazan. 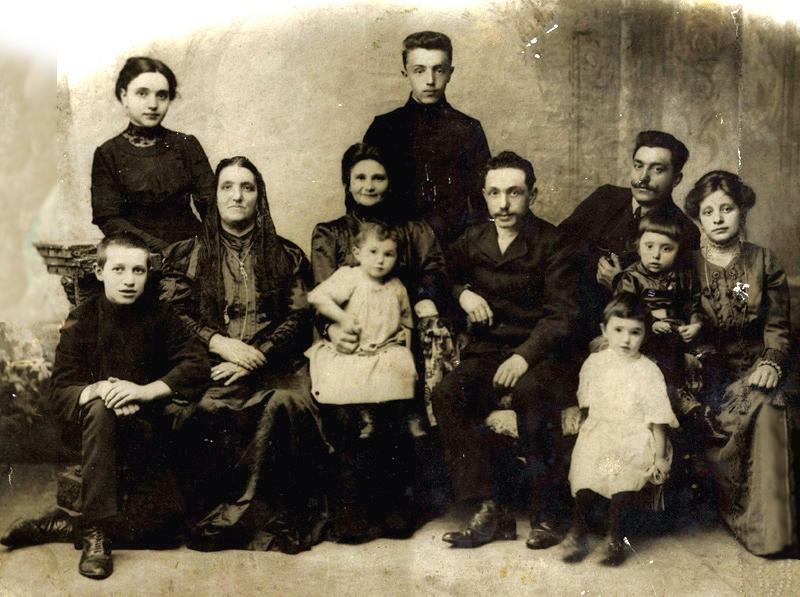 I’ve begun writing to the many JewishGen participants whose ancestors also came from Borisov and started getting some responses, with new bits of information. I’ve begun my usual search of Russian language websites – always something of a struggle because my Russian language skills are rusty (one of my most important tools is my son’s website, NiceTranslator.com, along with its Firefox plugin, which enables short translations to pop up on foreign language websites). And there are the hassles of doing dual google searches in English and in Cyrillic without a Cyrillic keyboard (I use a good virtual one). It’s a bit hard starting over, feeling once again how little I know about this new place, Borisov – new to me, that is. 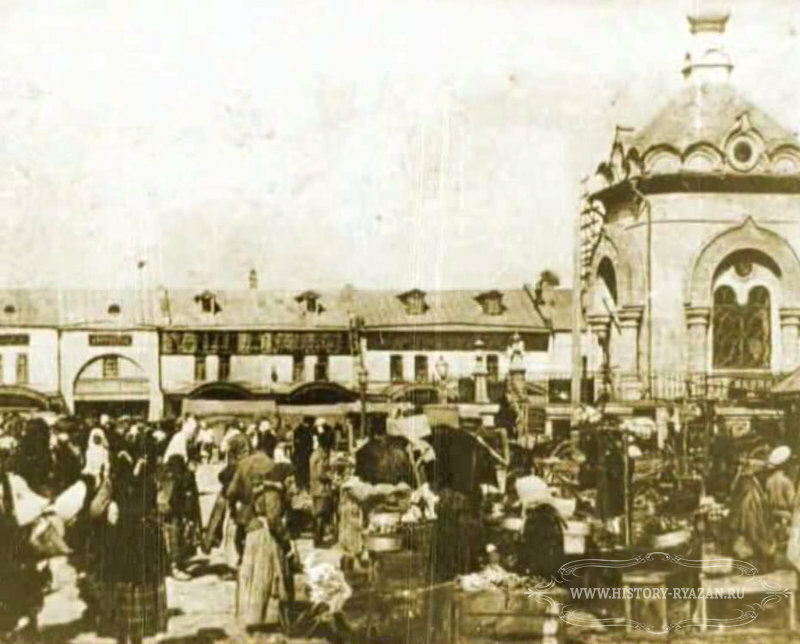 Postcard with photo of the Borisov market bazaar. 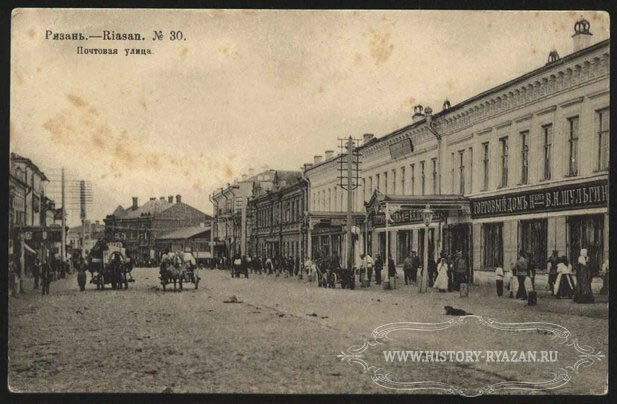 For Borisov, I’ve found an amazing stash of old postcards and other photographs, collected by Aleksandr Rosenblyum, a present-day resident of the city of Borisov (capital of Borisov uyezd). His website is called Cocktail of my Soul, and it’s about every aspect of Borisov past and present. The website’s many nooks and crannies probably hold riches I haven’t discovered yet. 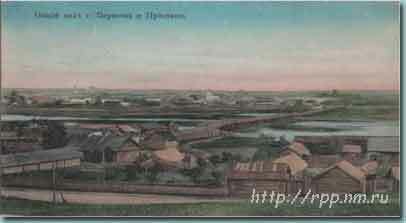 Postcard: General view of the town of Borisov and its pier on the Berezina River (the side of the town beyond the river is hazy in the background). Rosenblyum provides images of all the postcards, some even labeled as to whose shop sold it, Levin’s or Sheyneman’s! So here we have two clever competitors in business, each one-upping the other. 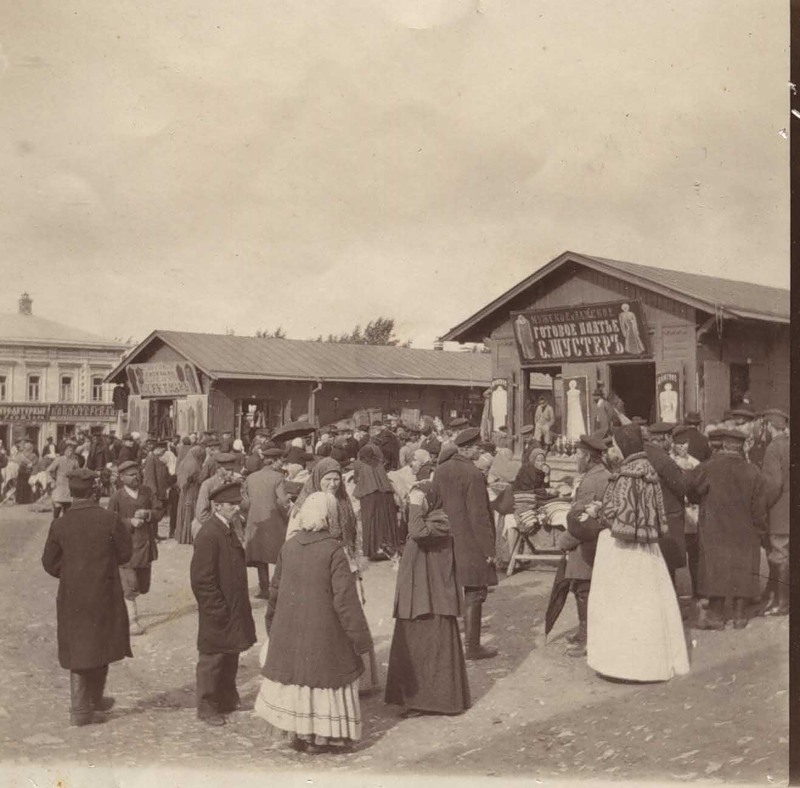 And they were competing via the latest technology of their time: photographs now available to everyone in the form of postcards of their very own town! We can imagine what excitement it must have spawned among small-town residents to suddenly see their own surroundings on cards they might be able to buy and send to family and friends. The cards sold out quickly and soon became rarities. 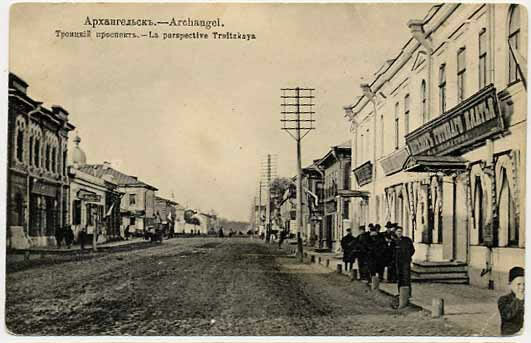 Postcard of Borisov's wine warehouse (the sale of wine was a monopoly held by the Russian Imperial government). The story of how Rosenblyum came to have this wonderful collection of old postcards is as delightful as the story of the cards themselves. Sometime after 1950, the staff of Borisov’s local history museum discovered that a famous Leningrad card collector, Nikolai Spiridonovich Tagrin, had the Borisov postcards among his vast collection. The museum tried to buy the cards from him, but were only able to acquire a few. Their efforts continued from various sources, but their collection remained very incomplete. Then, after Tagrin’s death, his wife donated his collection – consisting of 500,000 postcards – to Leningrad’s Museum of History. And in 1987, our hero Aleksandr Rosenblyum stepped in. He persuaded the editor of Borisov’s newspaper Communist Work to send a correspondent to Leningrad to make reproductions of the Borisov postcards. According to Rosenblyum, the correspondent followed through brilliantly. 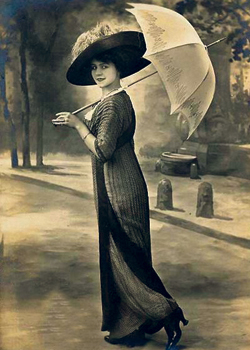 The postcards were eventually published with Rosenblyum’s comments, attracting great interest. 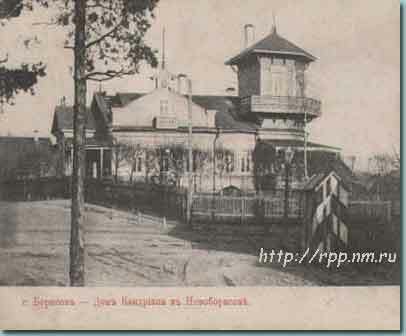 Postcard of house of Kandrian, a wealthy Swiss barrel-hoop manufacturer who immigrated to Borisov. So this transition back to Borisov, which I began with some trepidation, has ended with pleasure. Whatever the hardships of the Pale, there were in Borisov two inventive and successful Jewish stationary shop owners whose story – at least until the postcards sold out – is amusing and impressive. The postcards created and sold by Levin and Sheyneman still exist today, revealing to us many hidden corners of their world. 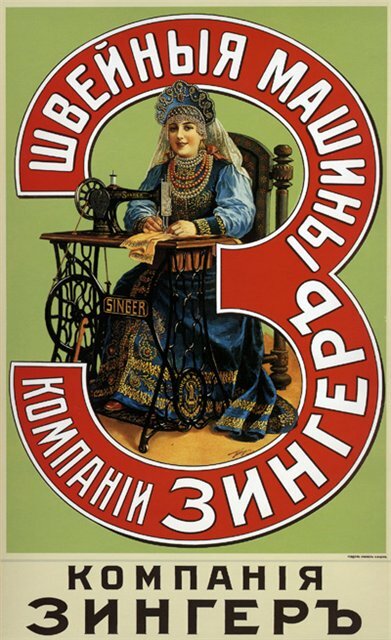 Singer ads portrayed women of many countries sewing at their machines. 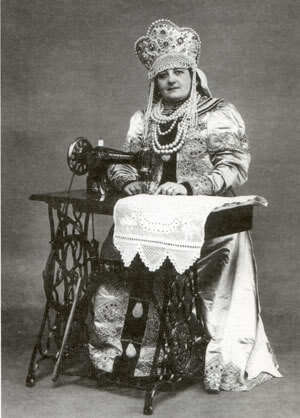 This is a woman in traditional Russian costume, including a headdress in reality far too heavy to allow bending over her work. 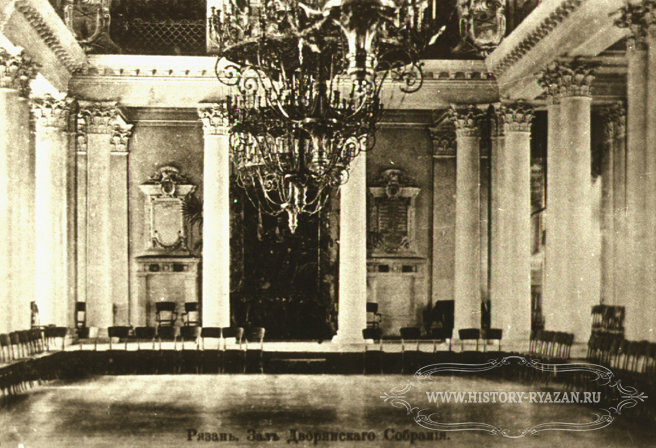 This is Chapter 6 of the thread “The World of Jews in Ryazan: Beyond the Pale.” The previous chapter can be found here. 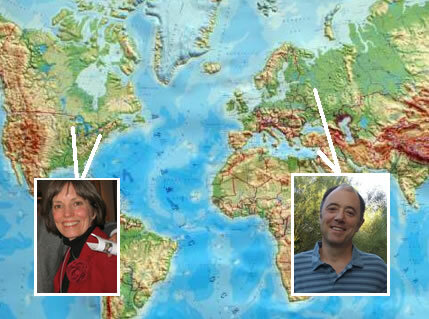 As described in a previous post, Yakov Kull and Rokhilya Bobrova both worked at the Singer Sewing Machine Company in Ryazan, Russia. What was work like for them on a day-to-day basis? What tasks were they responsible for at Singer? What were their relationships with people they worked with? With their superiors? Rokhilya almost certainly taught sewing lessons and/or demonstrated sewing techniques on the different Singer machine models. We can be fairly sure of this because these were the jobs the company typically hired women to do in Russia. More details of what work at Singer was like for such women as Bobrova are hard to come by. One thing we do know is that everyone who worked above her in the shop was likely a foreigner who did not speak her language well. Singer had a very hierarchical structure of managers and auditors. Non-Russians were sent from abroad to fill all supervisory roles. They may have learned some Russian during their time there, but were likely not very comfortable in it. We can wonder what it must have been like for Rokhilya Bobrova to interview for a job with, say, Germans or Americans, and to come to work every day in a place where all her superiors were foreigners. 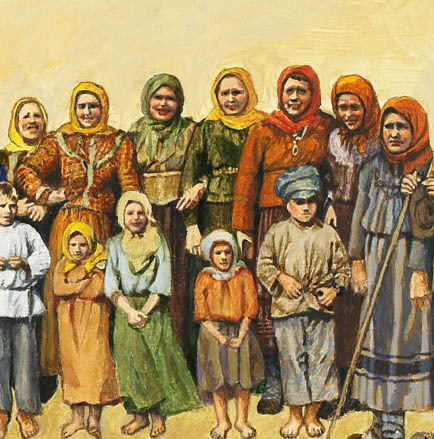 Rokhilya – a widowed mother of five – was, of course, herself something of a foreigner in Ryazan, having left her birthplace in Minsk province (now Belarus) in the Jewish Pale of Settlement, at about the age of twenty. Her first language may not have been Russian, either. But she had lived in Ryazan since 1887, for nearly 20 years before the Singer company arrived there, so her Russian was likely fluent. I like to imagine Bobrova interacting in a friendly way with her fellow employees as she worked each day. One of these fellow employees was Yakov Kull. 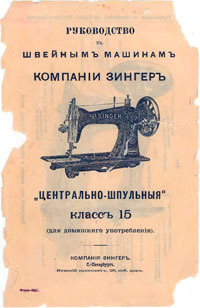 Manual for the Singer Model 15, a foot-powered treadle sewing machine. The canvassers were “thought to be the key to sales success; they were meant to be energetic, bright, knowledgable about the machines, and honest.” This description definitely seems to fit the enterprising young Yakov Kull, who had moved on to Singer’s from his job as shop assistant in a clothing store. We don’t know whether Yakov Kull canvassed the countryside around Ryazan or whether he worked primarily in the shop in town. We do know that he had grown up in a neighboring town, Zaraysk, so he would still have had contacts – perhaps potential customers – outside of Ryazan itself. We might wonder whether his former hometown became part of the sales territory he worked. A Singer Sewing Machine shop in Beloomut, Russia, 27 miles southeast of Ryazan. 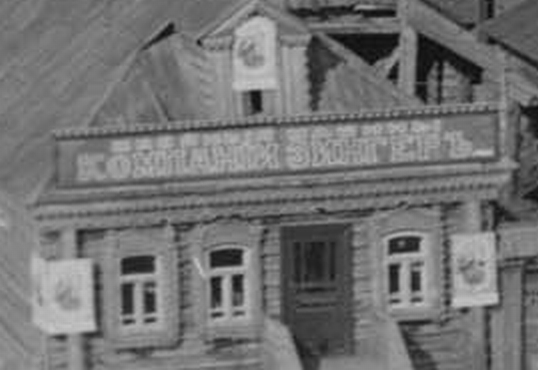 On the other hand, it’s possible that there was yet another Singer shop in Zaraysk which employed residents of that town. 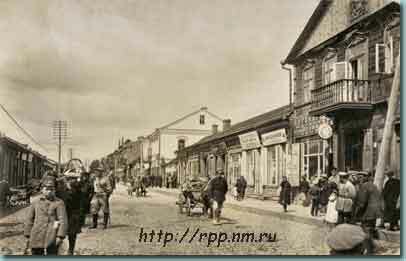 The photo to the left (sent to me by Yakov Kull’s descendent, Leon Kull), shows a Singer shop in another small town not far from Ryazan. The building’s traditional Russian architecture is beautifully decorated with typical peasant carved-wood trim. Note the large Singer sign across the top of the building, which reads “Sewing Machines / Singer Company.” Unfortunately this photo is too blurry to make out the images on the other signs, but they undoubtedly bore pictures of Singer sewing machines. They adorned the facade’s first and second floors, and the corners as well, so as not to miss potential customers coming down the street from either direction. 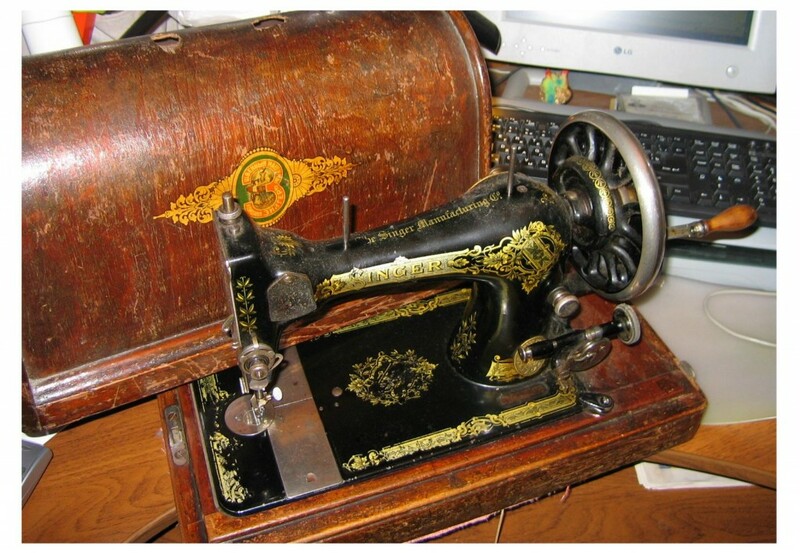 Hand-operated Singer sewing machine. "Singer" is printed on the wooden case in the Cyrillic alphabet, but not on the machine itself. Most customers bought their Singers on installment because the cost of a sewing machine was more than the average Russian’s yearly income. In the United States, Singer installment plans were paid off in two years. But because most Russians were too poor to pay that quickly, payments there were typically spread out over four years. 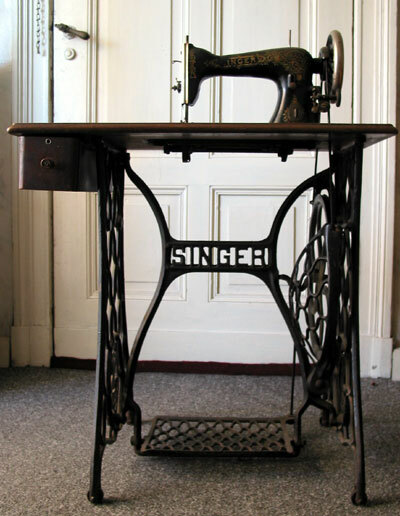 Typical Singer treadle sewing machine in table with iron stand. Russian sales agents such as Yakov Kull were responsible for collecting the installment payments from each of the customers to whom they sold sewing machines. It’s possible that Kull’s wealthier Ryazan customers bought their machines outright. 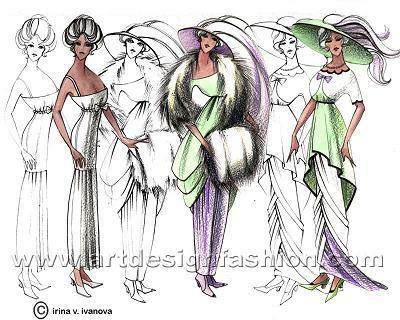 According to fashion designer Elena Kroshkina, sewing machines became part of the fashionable young woman’s dowry at that time, purchased by the parents of the bride. Once a customer made a down payment on a machine, it was not delivered until a credit investigation had been done that indicated Singer would receive all the expected payments. As Domosh explains, this was another reason the company hired local people familiar with the economic conditions of their neighbors. 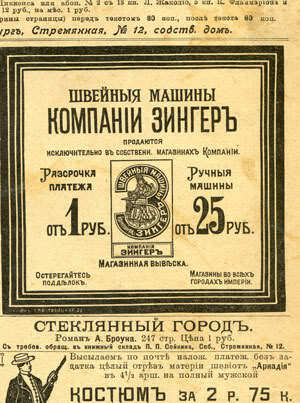 Singer newspaper advertisement for installment plans of one ruble payments. So Yakov Kull may also have been responsible for credit checks on customers, along with his other duties. For his work, Kull would have been paid a fixed salary, plus commissions on sales and collections. Carstensen tells us that, because sales agents were collecting large sums of money outside its retail shops, Singer constantly worried about theft. To protect the company, Singer required all sales agents, before being hired, to “deposit a security in the sum of 300 rubles,” which reverted to the company in case of theft. This 300 ruble security deposit, though, was a massive sum which most potential Russian sales agents could not pay. As Singer rapidly expanded in Russia, its corporate leaders began to realize they would not be able to find enough sales staff if they hired only people who could afford it. Singer also eventually realized it was to their advantage to employ people who were dependent on hard work for the company to earn their living. Sales agents who could afford a 300 ruble security deposit did not have the same level of financial pressure motivating them to work diligently. 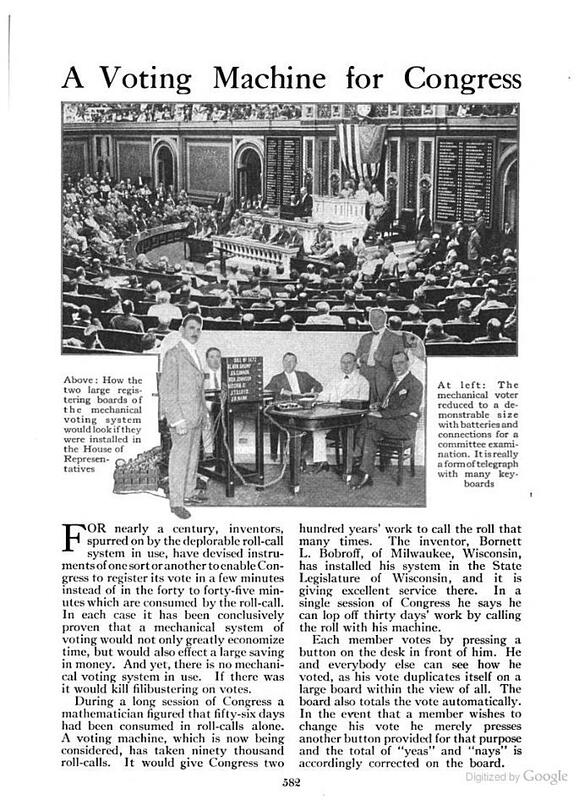 So Singer abolished the security deposit in 1908. Yakov Kull began working at Singer at roughly this time. 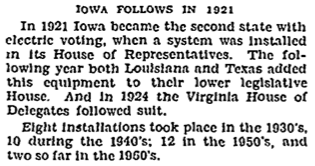 We might wonder whether this change made it possible for Kull to leave the dress shop and move to Singer, where he likely earned a higher income. At any rate, both Kull and Bobrova worked each day with a massive, hierarchical structure above them that required them to constantly account for work done and monies collected. Everyone employed by Singer had to make weekly reports which were sent up the chain of command along with receipts, finally reaching corporate headquarters in New York. 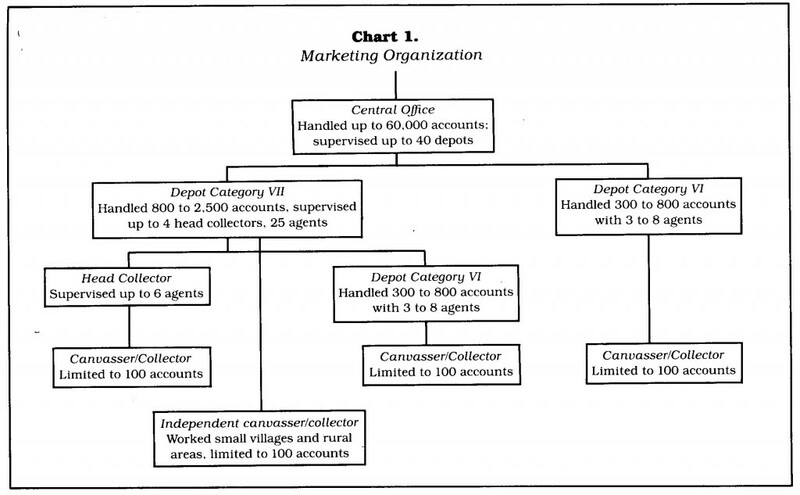 Singer hierarchy: canvassers (sales agents) were tracked and supervised by layers of managers above them. From Carstensen, American Enterprise in Foreign Markets. As I’ve described in an earlier post, because of the low level of entrepreneurial experience and training among the general Russian population, Singer turned to members of minority groups living in Russia, especially Jews, who did have the necessary background. As a Singer sales agent, Yakov Kull would have been responsible for selling other sewing items to his customers as well, such as thread and needles, and providing minor servicing on machines. 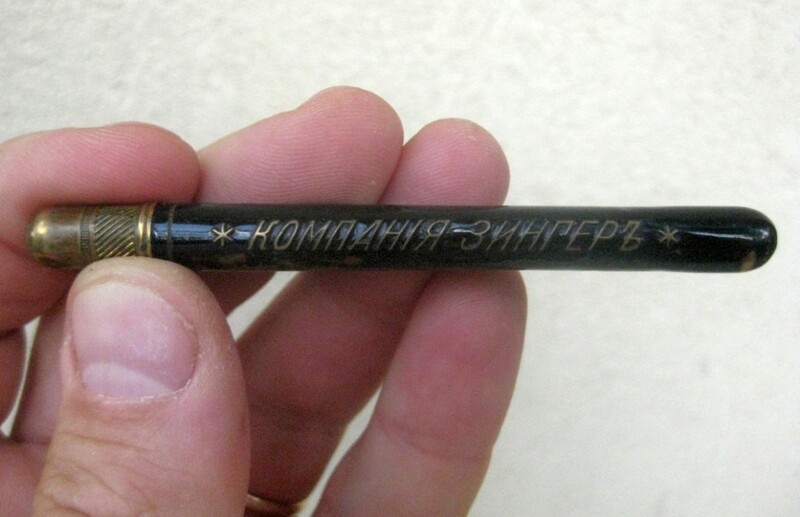 Small tube with Singer name, containing a pencil which may not be original. Another item sold was tailor’s chalk, contained in small metal tubes bearing the Singer name in Russian. Leon Kull, great-grandson of Yakov, discovered this fact via yet another extraordinary coincidence which occurred around the time I posted Extraordinary coincidence in Ryazan: Kull and Bobrova co-workers at Singer Sewing Machine. Of course, Leon bought the little tube on the spot! It had a pencil inside, stuck into the gold-colored cap. However, when Leon later spoke to an expert on the topic, he learned that these tubes originally held tailor’s chalk, not pencils. And here once again, Kull and Bobrova’s ghosts were dancing together, this time through the medium of a little brass tailor’s chalk holder!